Thanksgiving is one of the most anticipated holidays of the year! Regret-Proof now! I can feel the excitement leading up to it now, as I type this blog! It’s funny, I’m a dual citizen living in Canada and I’m quite aware of it this time of year. This will be the 35th Thanksgiving that I haven’t lived in the States and I have to say, I miss a good ol’ American Thanksgiving. But I don’t miss the stress. Like I said, I do miss a lot about this family, football and food-focused holiday. I miss playing saxophone in the marching band at the high school football game. I miss all of the the family coming home. I miss the fire going in the fireplace at my mom’s house. I totally miss the food…ESPECIALLY THE MASHED POTATOES. And of course, I miss the shopping after all of the food, folks and fun is over. One of the problems for me has been that it’s not that easy to get home for this holiday. First, I live in Ontario and up here in Canada, no one is “off” for the American Thanksgiving. With three kids in different universities, it’s just not happening. Second, the driving was always difficult because the weather made the trip unpredictable. So we got out of the habit and tradition of going back home for this holiday. We started planning summer visits back home instead. Easier for everyone. But it left a GAPING HOLE that’s for sure. If you can’t be with your family experiencing traditions you know and love, make sure to plan your own traditions that make you smile and bring back those memories. For example, if you loved marching band, pull out an old recording or search for band performances online. Better yet, look up your high school band online and see what’s happening. Make sure to watch the Macy’s Day Parade on TV and catch the awesome bands there too. If you love your mom’s mashed potatoes, call her up and talk to her about exactly what she does to make them so yummy so you can make them yourself. You get my point. Bring a little of home to your home. Practicing thinking thoughts that help you feel the comfort of home. Perhaps something like “I can figure out new ways to enjoy Thanksgiving that remind me of home.” This is more useful than focusing on what you’re missing. Now if you’re on the planning and hosting end of things, stress can really get you down. It can get in the way of a great holiday. Feelings like disappointment and overwhelm can be a problem too. Especially for moms who are typically busy with the majority of the preparations, cooking, baking, decorating and shopping. I love this term because it easily applies to so many important experiences, phases, transitions and milestones in your life. • You can regret-proof your career. • You can regret-proof your relationships. • You can regret-proof yourself. • You can regret-proof your life. • AND you can regret-proof your holidays! 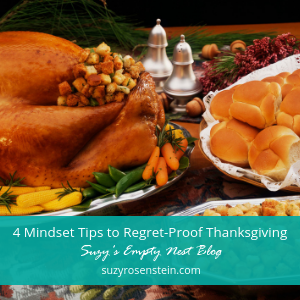 When it comes to regret-proofing THANKSGIVING, there’s a lot to consider. Yes, of course there’s reflection, family, travel, and festive meals. For Thanksgiving in particular, there’s also football in lots of families too. It’s no surprise that there’s also a ton to do, cook and plan. This list is especially long for MOMS. For sure, there’s a lot that goes in to making a warm and wonderful holiday experience for your family. Of course you want everything to be smooth, food to be delicious and kids to be charming. There’s a high chance that there will be some glitches of course. Just expect them. Don’t be surprised. • You will most likely spend more money than you anticipated. • The grocery store could run out of a key ingredient for something you’re making. • The turkey could be dry. • Your college kids could get stuck out of town because of bad weather. Because you’re organized, and started cooking way in advance, you could actually be more tired from stretching out all of the preparation over a longer time period. So how do you go about regret-proofing when there’s so much going on? ANSWER: One thought at a time. MINDSET TIP 2: Remember that thoughts create feelings. You can actually decide how you want to feel during Thanksgiving and create that feeling with your thoughts. This is possible because thoughts are optional. The thing is that thoughts are just sentences in your mind. They aren’t facts. They are thoughts about facts.What you end up DOING is always based on how you feel. The outcome, or results that you create with your actions will prove your thoughts…every time. YOU get to decide how you want to feel, in advance, on purpose. It can be an intentional thing. You might think that you can’t do much about this, but you can; how you’re going to feel isn’t up to chance. If you don’t decide ahead of time, there’s a possibility old habits will kick in and you will disconnect and react to something on autopilot. MINDSET Tip 3: Do what you can to really create that feeling that you want to feel, on purpose. The idea is that if you’re clear about how you want to feel, then you can also be clear about what you have to think to create that feeling. Feelings come from thoughts. For example, let’s say you wanted to feel relaxed. You love feeling that way when you’re surrounded by family and friends. You know that worrying about the food doesn’t make you feel relaxed. Thinking that you can’t relax doesn’t help either. But when you think, “I love having time to spend with my family,” you feel relaxed. So that’s your go-to thought. MINDSET TIP 4: Remind yourself to practice your intentional thought. When you catch yourself feeling riled up about the kids goofing off, remember to think this thought. When your mother-in-law says something about your meal that rubs you the wrong way, remember this thought. When your kids run from the table to watch football without taking their plates to the dishwasher, remember this thought. It’s a simple strategy, but it works. 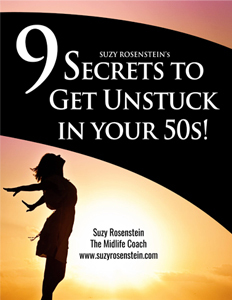 As a life coach, I love helping my clients learn more about mindfulness. For more regret-proofing practice, join my FREE Facebook group, Women in the Middle Podcast Community: RegretProofing 101. Let’s work on this stuff together!